Mary Tantillo, artist and owner of SwellColors Glass Studio, has designed hundreds of custom stained glass windows that reflect her love and appreciation for the stunning nature around us here on Long Beach Island, NJ. The collection that was completed last summer at SwellColors was called "Origin"- it includes a sun-inspired window for every date of Spring. This series pays homage to the source of all life on Earth, our beautiful Sun. 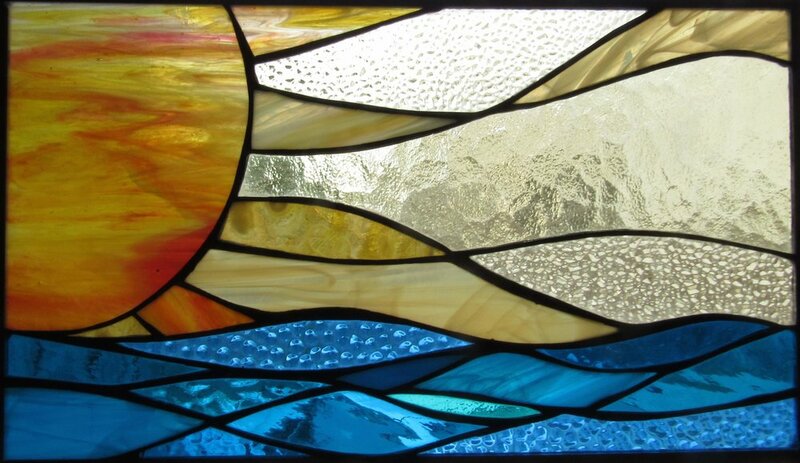 Check out the gorgeous stained glass panel for today, May 1st, is called "Windy Sunset". Or check out the entire collection here. All of SwellColors glass collections represent a different season of the year- with each date represented with a custom stained glass panel. Custom, one of a kind stained glass makes such a special anniversary, birthday, wedding, or "Just-to-say-I-Love-You" gift! And don't forget, Mother's Day will be here sooner than you think!